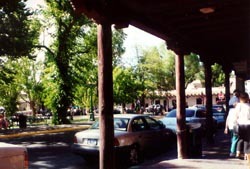 Santa Fe Plaza has been the commercial, social and political center of Santa Fe since c. 1610 when it was established by Don Pedro de Peralta. The original Plaza was a presidio (fort) surrounded by a large defensive wall that enclosed residences, barracks, a chapel, a prison and the Governor's palace. Eventually the wall gave way to large houses built by high ranking Spanish officers and officials. In 1822 the famed Santa Fe Trail, a trade route from New Mexico to St. Louis, was opened with its terminus in the Plaza. Today the Plaza is ringed by structures in the Pueblo, Spanish and Territorial styles that reflect its diverse history. Among the most noted are the original palacio, the Palace of the Governors, built between 1610 and 1612 and San Miguel Mission, a noted landmark c. 1640, and one of the oldest churches in the United States. Santa Fe Plaza, a National Historic Landmark, is bounded by Washington, E. Palace and Lincoln aves. and by San Francisco St. in downtown Santa Fe, New Mexico. The Palace of the Governors hosts tours of historic downtown Santa Fe at 10:15 a.m., Monday-Saturday, May-October; there is a fee. Visit the museum's website for more information. Santa Fe Plaza is featured in the National Park Service El Camino Real de Tierra Adentro National Historic Trail Travel Itinerary and American Latino Heritage Travel Itinerary.